Donna McDine is an award-winning children's author, Honorable Mention in the 77th and two Honorable Mentions in the 78th Annual Writer’s Digest Writing Competitions, Literary Classics Silver Award & Seal of Approval Recipient Picture Book Early Reader, Reader’s Favorite 2012 Honorable Mention, Global eBook Awards Finalist Children’s Picture Book Fiction, and Preditors & Editors Readers Poll 2010 Top Ten Children’s Books ~ The Golden Pathway. Her stories, articles, and book reviews have been published in over 100 print and online publications. Her interest in American History resulted in writing and publishing The Golden Pathway. Donna has four more books under contract with Guardian Angel Publishing, Hockey Agony, Powder Monkey, A Sandy Grave, and Dee and Deb, Off They Go. She writes, moms and is the Editor-in-Chief for Guardian Angel Kids and owner of Author PR Services from her home in the historical hamlet Tappan, NY. McDine is a member of the Children’s Literature Network, Family Reading Partnership, and SCBWI. Visit www.donnamcdine.com. 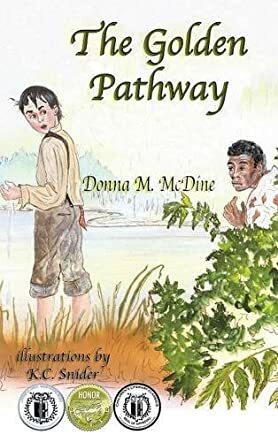 The Golden Pathway is a heart-gripping children’s story written by Donna M. McDine with illustrations by K.C. Snider. This story takes place during the dreadful days when people were allowed to own slaves and abuse them. A boy named David lives on a farm with his ma and pa. His pa is a mean soul and owns a slave named Jenkins who is just sixteen years old and works in the cotton fields for him. One night, David hears the terrible screams of agony coming from the barn where Jenkins is being whipped by Pa. David feels a great amount of compassion for Jenkins and knows that slavery is wrong. David is compelled to do everything in his power to help Jenkins because he knows he will soon die from the continual beatings. David will have to find incredible strength and courage to help Jenkins escape slavery and to stop the horrible beatings and torture inflicted upon him unjustly. The Golden Pathway is written specifically for children 8-12 years old and is written perfectly to their level of understanding. It is easy to comprehend and the plot flows smoothly. The illustrations are beautifully depicted and complement the wording immensely. I found this story to be powerful, inspiring and something that will provide children with a valuable lesson about slavery and freedom as part of American History. I can see this book also providing a valuable tool for children to ask questions and bring about important conversation. I feel strongly that this book is a must read for all children ages 8 and up.